Here you can choose from a selection of videos, podcasts, texts etc to help you improve your English skills. Please click on any item below that interests you. The English We Speak – Every week, we look at a different everyday English phrase or piece of slang in this fun three-minute programme. From BBC World Service. Six Minute English – Learn and practise useful English language for everyday situations with the BBC. Your weekly instruction manual for saying or doing something in English is published every Friday. English Drama Series – Dramas for English language learners from BBC World Service. Improve your English with retellings of stories classic and new. Each episode is between 6 and 10 minutes long. English at Work – These podcasts are all related to many different situations that take place in the work place. Cambridge Speaking Test Videos – Here you can view a collection of videos provided directly by Cambridge. These videos include most of the speaking tests including the First Certificate, CAE Advanced English and CPE Proficiency. They will benefit anyone who is planning on taking any of these tests and they will show you how the test works and what you can expect. Pronunciation with Tim – This is a comprehensive pronunciation video programme over many episodes that covers many aspects of English pronunciation. This collection is provided by the BBC. Pronunciation Sounds – This video collection concentrates on the individual sounds in English and is a great way to perfect each utterance just like a native. Drama – White Elephant – This series of videos shows life in a restaurant that always has problems and challenges. This can be great for learning vocabulary, phrases and grammar connected with food, cooking and restaurant service. Drama – Inspector Stone – Series of 4 animated shorts, each looking at a popular English phrase or expression, as used today. These short stories follow the cases of Inspector Stone and each case is designed to teach the different aspects and grammar points in English. Improve your grammar, phrasal verbs and idioms. 6 Minute Vocabulary – This collection of videos provide useful new vocabulary and helpful ideas to ensure you can improve your English vocabulary. Grammar Gameshow – There are 29 Videos covering many aspects of English Grammar. We are certain these videos will help any student who wants to perfect their level of English. These videos cover most aspects of grammar including tenses, prepositions, conditionals, modal verbs, relative clauses, comparatives and many other aspects. IELTS Writing Test – View actual examples of the IELTS General and Academic Writing Test. LBC Radio London – (leading britains conversation) This station is a conversation only radio station and it is a great way to allow you to listen to many people every day talking about the all important issues and debates of the day. It is also a telephone-in radio station – this means that the public often call the radio station and give their point of view on a wide range of daily topics. BBC World Service – The famous BBC World Service where you can listen to a whole range of Worldwide current affairs. UK Live TV – This is an internet site that shows all of the UK TV stations LIVE and work andwhere in the World. If you watch the station on a tablet or smart phone you will also be able to transmit/cast the programmes directly to your TV. On the main menu simply press UK Live TV – Enjoy ! Alejandro Huerta – Spanish living in Dublin Ireland. I am really delighted with the classes that I have had. I think that the classes have been very professional and the teacher has always been encouraging me in class. I’m so satisfied that I will continue having this class. I highly recommend everybody to take classes on skypeclass.com. All the classes you will take are going to be arranged perfectly, so you won’t regret about any minute you spent on it. I should confess that the the classes that I had were the best experience in English I ever gained in my life. I really needed to speak fluent English in my work and interviews. The method gave me the opportunity to do it without wasting time and at home. In a few weeks I was able to lose the fear and talks english fluently.From my point of view, a great teacher, always attentive to the needs of the student and the proper feed back both written and oral. I will continue with classes. Thank you very much for your great help. Through ‘Skypeclass’, I have received more than I have expected. I have found exceptional teachers that help you overcoming your level of english quickly in an easy way. Philip knows what he is doing –the classes are good. We discuss many different topics and he allows me to speak most of the time. He listens to me carefully and corrects me on the spot when I make a mistake, which enhances my pronunciation. After having classes with him, I have gained confidence in conversation and have much improvement especially in pronunciation that I need to develop. Thanks to my Skypeclass lessons, my English is becoming more fluent and I feel more confident in many situations. The teacher is exceptionally professional, diligent and friendly and every class new interesting topics are proposed. This method is also very convenient since I can talk with a native English speaker staying here in my home. So I’m improving my English in a natural friendly way, without any pressure. I am very satisfied with my classes and already recommend them to my friends. The teacher creates a great atmosphere, in which, even being a shy person and despite being aware of my mistakes, I am not too stressed out to talk. This rarely happens to me while communicating with other people. I learn idioms, proper British-English pronunciation, as well as colloquial expressions. This is everything I was looking for. I feel that with each lesson I gain more confidence in speaking. I know I can rely on my teacher to show up on time and to deliver the promised materials. These classes give me – a person on maternity leave – a chance to educate myself while still being at home and taking care of my baby. Thumbs up to Philip and thank you for giving me this opportunity. I have just had the english exam which I have been receiving english lesson for with skypeclass. I know I will pass it and with good qualification marks thanks to skypeclass. I strongly recommend skypeclass. Emilio from Spain, now living in Qatar. I have been taking classes with Philip for a long time, he is a great English teacher. My experience in SkypeClass has been really positive. Due to my job in a foreign country I needed to improve my fluency asap and now I feel more confident speaking English thanks to these classes. The teacher has been always supporting me and encouraging me to gain confidence in class in a friendly way becoming even into a friend to whom you can talk about anything. I highly recommend these classes to people who want to improve their fluency, pronunciation and vocabulary with a native English teacher, the best way to learn how to speak English. Before my classes, I was really shy of speaking English. That has changed now and I’m happy to have good talks with English people. The topics are very interesting and I can feel the progress oand my confidence to speak english. I highly recommend skypeclass, to improve and practice English speaking. This website is a very good idea. My hope was to be in England for a period to allow me to practice english. However, because of my children, I can’t be absent for a long time, and because of my job also. So to practice english at home with skypclass is a good solution, even if I think that 45 minutes a day is not enough. Thank you so much Philip! You are an excellent teacher! My experience with skypeclass has been very useful. I think skype classes with Phillip are perfect for people who have an intermediate level and want to improve speaking and vocabulary. In my case I had forgotten my English after years without using it and after a few clases I could express myself much better. The teacher forced me to speak during the whole classes and this is perfect to achieve a good level of english. Speaking, speaking, speaking.. This is the best way to improve.. Practice makes the master! I’ve enjoyed a lot my Skypeclass lessons. The topics are interesting, the teacher is kind and everything is done in a very professional way. I highly recommend these lessons. Thanks a lot Philip! Having taken 20 classes with the Teacher I realized that there is always room for improvement in English despite being advanced in it. During those highly energetic and motivating classes we covered a broad range of topics that boosted my vocabulary and rendered extra points on the confidence scale. The Teacher encourages you to speak by asking open questions and then he listens attentively to correct any mistakes. All in all, remarkable experience which I strongly recommend to anyone seeking to improve their English. I’m Stephany a srilankan. I really enjoy having conversations with Philip on different topics .Besides English I learn different things and I think this is a really fun and easy way to learn English fast. I found the classes very useful. My objective was to improve my pronunciation hoping to perform better in job interviews, the classes allowed me to be aware of many pronunciation mistakes I was doing and how to correct them. My English communication ability hasn’t been enough for my job, but I can really recognize that this class makes me to continue improving and to progress in speaking. Thank you again. English classes with Philip were very helpful and enjoyable. I would like to thank him for the interesting and stimulating conversations. There were a lot of diverse topics which help me to expand my vocabulary and broaden my horizons. The teacher was very attentive and supportive. I would definitely recommend lessons with Phillip to anyone who is looking for the professional and enthusiastic teacher. Mr Philip’s online English classes are an excellent way to improve your English conversation skills. He is so committed and runs it professionally. I had several classes on how to answer interview questions, and it helped me a lot and made a positive difference of how I perform in interviews. I had more than 30 classes and planning to continue with him, as I gained confidence in my self during English conversions, specially at work. Thanks to Philip’s lesson I’ve been able to deal with a job interview in English and be hired. 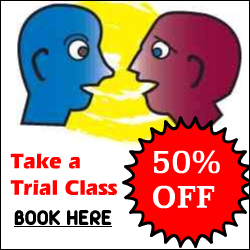 I sincerely recommend his lesson, it is always an enjoyable way to learn and improve significantly your vocabulary and speak fluently, with an attentive and supportive teacher.Try his trial class, I’m sure you want to continue. David Khosid, from Israel, living in London. Philip has been teaching me English conversation for 20 lessons. Philip is an excellent teacher, with established effective methods to improve English fluency. His method requires preliminary reading and listening on 2-3 topics before every class. This is a time to learn about interesting subjects and enrich your passive vocabulary. In the following class every topic is discussed which helps to create an active vocabulary. During classes Philip asks many questions which helps to create dynamic conversation. Concerns of having lessons by Skype were dispelled and quality of voice was always perfect. I have found MP3 recordings useful as well. I see a strong positive effect of our lessons, have improved my fluency, pronunciation and confidence. I would highly recommend Philip. I have taken 20 classes with skypeclass’ teacher Philip over a couple of months, to prepare for the IELTS test. Thanks to Philip’s honest coaching and useful hints, I developed the necessary skills to achieve an overall 8.5 band! I owe this excellent result to Philip, since our conversations helped me to improve my fluency and vocabulary, and also made me feel much more confident during the examination. I have become able to convey my ideas in a more efficient way when speaking and, as a welcome side effect, also when writing. Philip is extremely professional and he will tailor his method to your needs. All topics discussed during the online classes are stimulating and allow you to quickly expand your vocabulary in a very instinctive way. Whatever your ultimate goal is, don’t miss the boat: reserve your trial class today and let Philip take you to the English level you need. I would highly recommend the classes with Philip. Discussing about real life topics has improved my confidence and fluency in English. Although I use English in my daily life and job, these classes have helped me to expand my vocabulary and better understand native speakers expressions. Philip is an excellent teacher and speaker and he makes me talk and talk with no stop during the whole class. Also, the emails with vocabulary, phrasal verbs, podcast… that he sends are very useful and again, very real English focused. And last but not least, the class reservation system is so flexible that I am sure I can always find a free time slot to schedule a class per week. Definitely, an English class system that worth a try!! I appreciate a lot the classes with Philip because I find them very helpful for improving my English. I find the overall learning experience really motivating and rich of many different topics that favor the conversation. The classes meet my needs really well and so I do not have any suggestion to give. Starting Skypeclass with Philip, my spoken English improved a lot. The suggestion of listening LBC radio was very helpful. The classes helped me to become more fluent in English and to expand my vocabulary. I also liked it better just to discuss two topics in class as it allowed me to talk about them in more detail. Especially when I had many ideas about a certain topic it was good to talk about it in more depth. When I did not like a topic or had no ideas about what to say we moved on to another one, this was helpful. So all in all I did enjoy the classes and they helped me to get better in English. I have been a student for 4 months. I am very satisfied and surprised, because this is more than I expected.Classes are interesting useful,creative and are adapted for you. Topics are different but still connected by a hidden thread that builds your vocabulary gradually.The Teacher is your excellent choice, be brave and make Skype Class yours. Choose a time and results will follow. Alexander Babaev – Moscow – Russia. I see great results after only 10 classes! Now I speak with confidence and make less mistakes. Also it doesn\’t take much time to think what to say next (it was a big problem). Definitely I will continue. Very enthusiastic teacher, kind and very good humor. The classes are very good for listening and speaking improvement. The grammar improves as well as we have many corrections after class. Great way to lear directly with a british english teacher. After ten speaking classes with Philip I have not only improved my speaking skills but as well I have gained a great deal of confidence And being able to talk about different topics and use new vocabulary meant the class was never boring and always of great usefulness. And of course, written feedback at the end of the class helped me to correct easily my mistakes. Highly recommendable! Cristina Granata – Italian living in Germany. My feedback on your English classes is deeply positive. The topics are always interesting and I like to read them not just for the classes but also for my interest and knowledge. With your classes I could improve my English and now when I speak English I\’m more confident. You are flexible about the different request. You have taught me English and also to have more trust in myself!! Thanks a lot. I’d like to say “Thank you” for extremely interesting classes. They were very interesting and helpful for expansion of my vocabulary. The topics covered very important and far-ranging subjects from politics, culture and economy. I could not only improve my linguistic aspects, but I could get many new useful information. We were sharing our opinions on various topics. In three weeks I felt significant improvement in my speaking skills. There was never a dull moment with you, Thank you and wish you much fun with many other students. These are a highly recommendable classes, because of the methodology used by the teacher as is his professionalism. If you need to improve your fluency, speaking and listening English in the quickest way, contact him. He will surely support you to reach your goal 100%! I enjoy our classes a lot! I improve not just English skills but also diversify myself in different spheres. Philip is an excellent teacher! I didn’t feel confident speaking English but I’m getting better with these classes and now I feel more confident when having a conversation with a native. Highly recommended! Philip is a particular type of person who makes everyone feel comfortable interacting with him. Being intelligent and good-natured person, while having an unusual charisma, Philip is capable of making interesting discussion on any subject. He delivers his classes in an easy-going manner. At the same time Philip takes very responsible and systemic approach to the whole teaching process. Every single stage is well thought through from carefully planning a class, to reviewing errors, to booking a lesson. So a student can simply focus on learning and get a pleasure of the process. To conclude, I can hardly imagine what can be improved in the classes with Philiip and can definitely recommend him to would-be learners. I am very glad that I’ve found this website and met my teacher. He is always attentive and patient when it comes to improving my speaking skills. He knows when to correct my grammar and to let me keep talking. I believe I can improve my communication skills if I keep practicing with my teacher. I tried different ways to improve my English and also tried different teachers for Skype lessons now I am very happy because I found the right way and the right teacher. I have been taking lessons here for a while and I have already learned many things.It is very easy to improve your English speaking with these lessons. It was a pleasure to have regular conversation with you and I am convinced that I could benefit a lot. Not only are you a patient listener but you are also an excellent and very sympathetic teacher. English lessons were very helpful for me, gave me possibility to develop conversation skills and to know a variety of topics from differents fields. Thanks to it I could acquire a lot of new words and knowledge about many fields helpful in our daily life and many others: history, culture, science, geography, etc. Ekaterina Saveliev – Moscow, Russia. Everybody knows how difficult it might be to find a qualified teacher over the Internet with so much fraud around. I have already been a student here for nearly three months and know for sure that these classes are genuine and the Teacher is really helpful and deserves a lot of respect. He is a very careful listener and has a unique quality to encourage a student to do much of the talking throughout the class by leading the conversation so skillfully that even shy and insecure people (like me!) gain confidence in their ability to speak about almost everything in English! I´d like to say that English lessons via Skype with conversation class are being very productive. There are several reasons: you receive lessons at home, not wasting time and really get fluency. Personally I am very satisfied. Remember me? I passed my CAE exam with a grade A and did ‘excellent’ in the speaking part! This, of course, mostly thanks to you and I would like to thank you for this once again and wish you the very best for you and your future students. I asked the Teacher to help me pass the IELTS. When I started my speaking score was roughly 6.5. After 6/7 lessons I took the test and I got an 8. I owe him big time. Your IELTS lessons as well as the other lessons have been very helpful and I have been very motivated from your class. Today I passed my test. Without your encouragement and support, I do not think I can do it.Thank you very much for your teaching. It is my pleasure to learn english from you, an enthusiastic and professional teacher. Francisco Jose Marquina Muñoz – Murcia Spain. These classes are incredible, good and effective. Not only do you improve your grammar and pronunciation, and learn new things about british culture but also and most important you gain confidence. I think that the IELTS conversation classes that we had were very helpful; the advice and information that you shared have definitely prepared me better for the exam. I enjoyed every lesson with Philip. The subjects have always been interesting and actual. A very good base for discussion. The organisation of SKYPECLASS is excellent. I can highly recommend to improve the conversation level with this method. Lilliana Rodriguez – San Jose – Costa Rica. A few months ago I started taking Skype classes here and now I’m very surprised at how my vocabulary and pronunciation have improved. Now my self-confidence has improved too, and I feel that I can talk about any topic with anybody. I contracted this service for the preparation of some job interviews. I helped me a lot to be more confident, to correct the main repetitive mistakes and to improve my oral expression. The teacher adapted the classes to the specific technical topics of my profession, which is not easy at all. I can only say that it was worth every single € I paid. Get free English Tips by email, including Podcasts, Grammar, Idioms, Phrasal Verbs and other advice to help you speak better English.